Welcome to the ECSC Classifieds page. 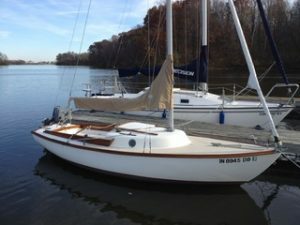 This page is for members to post boats or sailing gear for sale or items you want to purchase. If you are a current or past ECSC Club member and wish to have an item posted on this page please email a description of the item (with a picture if you wish), the price, and your contact information to publicity@ecsail.org . Your item and contact information will be posted for an 8 week period and then will automatically be removed. If you item sell (or you find the item you have advertised) please email me again at the above email to have the item removed. If you wish to have your item re-listed or extended past 8 weeks, email me and I will re-list the item. 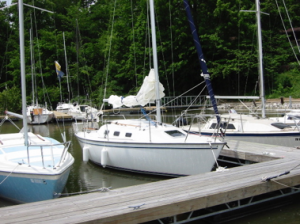 CLICK HERE for detailed description of standard equipment on this sailboat. 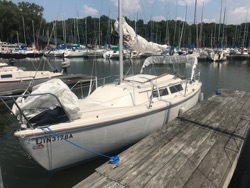 2006 Catalina Capri 22 lightly used and excellent condition, wing keel, fully outfitted to single-hand from cockpit. Sails: main, 150% genoa on furler, and asymmetric spinnaker with telescoping bowsprit. Additional racing rudder, adjustable backstay, racing instruments, navigation lights and built-in stereo system powered by two 12 volt batteries; new (one-year-old) tiller, removable solar panel. 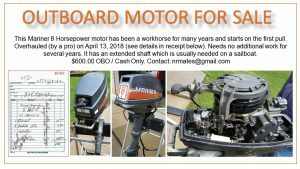 2011 Tohatsu 4 hp, 4 stroke outboard motor. 2006 Trail Rite trailer. $16,000. Call Larry Goldblatt 317-509-7850. 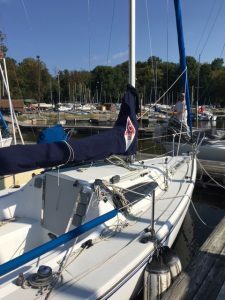 FOR SALE – 10-31-2018 – 1977 ODay 25 “Ghost” — Good sailing condition. Some updates done recently — new interior cushions and led lights. 9.8 Tohatsu engine, 2 marine batteries 2015 with solar charging. Needs new interior bulkhead and entry hatch. Multiple sails – Main and Genoa and more. Need to sell. Asking $4,500 OBO. Email Dan at dhrobertson@runbox.com or text 317-997-1964. 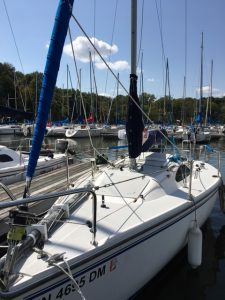 FOR SALE – 10-2-2018 – Flying Scot sail# 6078, year 2015. It is race rigged and in excellent condition. Only sailed 4 or 5 times. Stored indoors and covered. Asking $20,000. Contact Steve at 574-286-6608 with questions. 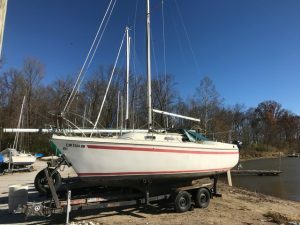 For Sale – 6-28-2018- Rare S2 8.0 Center Cockpit shallow draft sailboat and duel axle trailer. Very well maintained for a 42 year old boat. One of only 210 built by S2 Yachts. Sailed the past 15 years on Eagle Creek Reservoir. 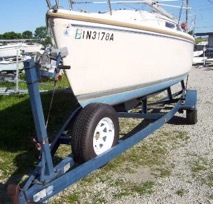 Atomic 4 engine, 3 sails, easy on/off roller trailer. Fresh water only. Contact Bob Meehan at 317 two nine nine 4351. Boat is at the club. PRICE JUST REDUCED $8500. 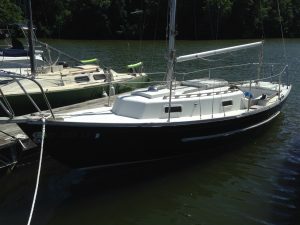 FOR SALE – 4-6-18 – very well-cared for Cape Dory Typhoon Weekender, with trailer, Yamaha outboard, all sails and equipment. Call John Hayes for details at 317-529-1550. Flying Scot in excellent condition. 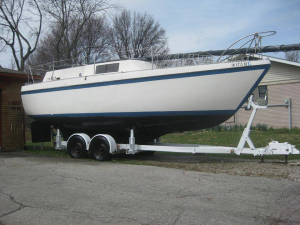 Complete with 3 sails, aluminum trailer, travel cover, 2hp outboard, tiller extension, & winter indoor storage. 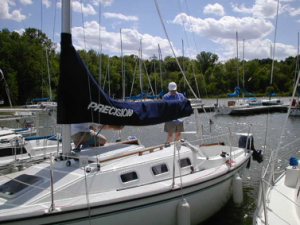 fit the Precision 23 sailboat. These are almost new. I had a problem with them new and sent them back to North Sails, who found the error and corrected it. (Problem was a luff rope stitched too tight, making it impossible to pull the sail tight enough for best racing.) Now it’s back but I already replaced it. Sails for sale are specked by North for longest life. Price for these is less than one half new price, at $450 each. These have not been used since North Sails first year repair. 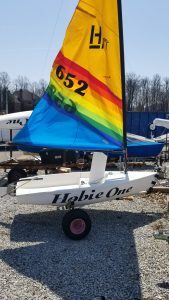 FOR SALE – (4/15/18) – Hobie One (Holden Hawk) – asking $600 for the boat and dolly with title. Contact Marcus Rogers at morgers35@att.net. 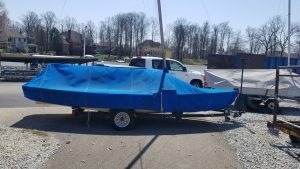 FOR SALE – (4-15-18) – Lightning – asking $700 -it is complete. It weighs 695 lbs and needs some TLC. 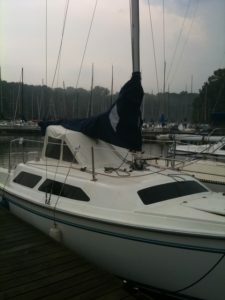 Comes with a good main and jib plus two good spinnakers. I can be reached at mrogers35@att.net.